Completely free to play, Aion is a fantasy MMORPG set in a world where an ancient immortal race known as the Daeva suffered a world changing event known as the Catacylsm that split the world in two. This schism divided the Daeva into two sub-races, those that dwelled within the darkness for centuries, changing into a more demonic form and naming themselves the Asmodian, and those who spent their centuries in the sun’s light and took on a celestial visage and named themselves the Elyos. Both races blamed each other for the Catacylsm and the division in the people, their appearance, their culture and beliefs has led to a bloody and endless war between the two. Now as one of these immortal Daeva it is up to you to choose your side, decide your career, and battle through a world of monsters and enemies in challenging PVE instances and PVP combat! Aion at its core is a traditional theme park styled MMORPG focusing on a quest based story driven narrative to guide players through the game where they will progress on a solo adventure that can be completed with friends, random groups or assembled player organizations known as Legions. As players level up they will “Ascend” and earn their wings for flight, allowing them to travel across various flight zones for a period of time and even engage in mid-air combat with AI enemies and other players. Ascension brings on a players career path where they choose to hone their class, and as they progress down it they will unlock new skills to use in combat, allowing them to grow stronger and take on more challenging enemies, allowing with a gear system where various armors, weapons and items can further improve a character. 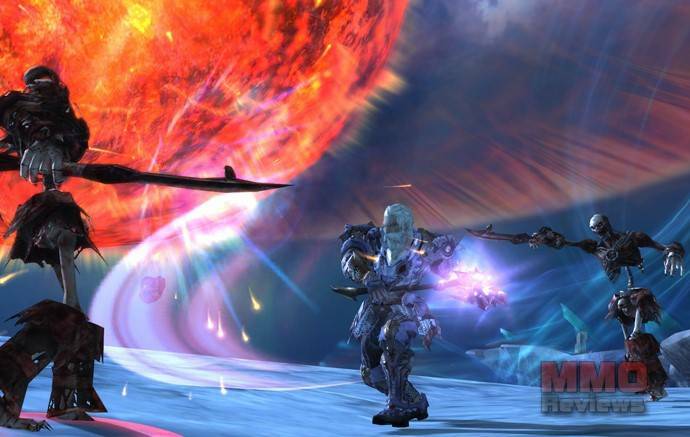 There are six classes to choose from in Aion, each class representing a different combat style and role which will suit different types of player; for those who prefer to be a forward melee combatant tanking damage to aid their comrades then the Warrior is an ideal match, their careers are Gladiator who can use polearms for sweep attacks and more damage, or Templar who uses shields for added protection. The Scout trades the Warrior’s strength and defences for agility and dextrous attacks, never staying in combat for too long and trying to end a fight quickly either as a melee Assassin with their high damage burst, or as a ranged Ranger with their bows. Few can match the damage and destructive capabilities of the Mage who harness the elements, either summoning them down directly as a Sorcerer or touching their elemental spirits as a Spiritmaster and focusing on hindering and crowd control. The Priest is the last of the original four classes, a healer who is a necessary support for any group, patching up wounds they can be more combat focused as a Cleric and become more battle-hardened, or enhance their healing and curative spells as a Chanter. The most recent classes added are the Engineer and the Artist; the Engineer uses powerful technology and as a Aetherech can call forth mounts forged for battle or use aethercannoins and pistols as a Gunner to deal damage from range. The Artist uses music as her weapon, though when she ascends she only has a single career; the Songweaver, this jack-of-all trades can heal, deal damage, hinder enemies and bolster allies and is an asset to any team. The game has six professions to use in crafting; Weaponsmith, Armorsmith, Handicraft, Cooking, Tailoring and Alchemy, each are able to create unique items that can be equipped or consumed by themselves or even sold to other players. There are various ways to gather the needed materials for different crafts, and some professions, such as Weaponsmith and Armorsmith, have key items that can be used to enhance their gear adding new boosts, upgrading current ones and even adding additional effects to weapons each time they strike an enemy.